Your refund depends on your individual financial circumstances. 1. Can I Include Social Security Withheld as a Deduction? Under the federal tax system, your employer withholds money from each paycheck and sends it to the IRS to pay the taxes that you owe for the current year. When you file a return the following year, you calculate how much tax you owe for the entire year, using deductions, exemptions and credits to lower the bill. If you've paid too much, you get a refund; the amount of the refund depends on your particular circumstances. If you have had a more than necessary amount of taxed withheld from your regular paycheck, you will receive a refund after filing your tax return. Your employer withholds money from your check for taxes, but the amount of the withholding is somewhat within your control. When you start a job, you complete a W-4 form which has a box for allowances, typically based on the number of family members in your household. The more allowances you claim, the less money will come out of your check. You can even claim exemption from taxes if you have valid grounds to do so. Alternatively, you can also claim zero allowances for maximum withholding or ask that additional money be withheld from the check, if you expect to owe taxes on other income. For example, if your spouse is self-employed, you can arrange for additional withholding from your own paycheck to avoid the inconvenience of your spouse making quarterly estimated tax payments. You can also adjust withholding – for example, if you have a new baby and want to claim another allowance – by filing another W-4. At the start of the following year, you prepare a tax return to figure out how much tax you actually owed for the previous year. In 2019, for example, you file a 2018 tax return. On the return, you add up all your income from wages, investments, self-employment and other sources. For tax years up until 2017, you can subtract personal exemptions. For example, in 2017, you get a $4,050 exemption for yourself, your spouse and each dependent. However, with new tax reform changes starting for the 2018 tax year, there is no personal exemption you can claim. But, standard deductions were doubled. For your 2018 taxes, you can still subtract deductions. Most taxpayers choose the standard deductions – which is $24,000 if you're married filing jointly for 2018. You can also itemize expenses, instead of taking the standard deduction, by writing off mortgage interest, certain medical expenses, business-related costs and so forth. If your deductible expenses are low, you can take a standard deduction. Your remaining taxable income determines your tax bill, but you can shave away at this amount, too, by subtracting credits such as the $2,000 child tax credit for each dependent child under 17. After figuring out how much tax you owe for the year, you then subtract the amount of money your employer withheld from your paycheck. In January, you should have received a W-2 showing the amount of withholding from your employer in the previous year. If you've paid more in withholding than you owe in taxes for the year, the IRS sends you a refund of the difference. 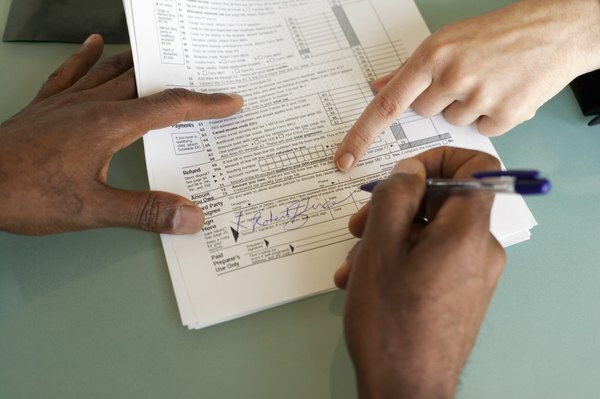 If you didn't have enough money withheld from your check, you owe the IRS. The IRS sends out refunds within a few weeks after receiving your return; the process is faster if you e-file. If you work as a freelancer, or don't receive a regular paycheck from your employer, you're not subject to federal withholding. Instead, you pay estimated taxes in quarterly installments in April, June, September and January. If your estimated payments are higher than the tax you owe, then you will receive a refund of the difference after filing a return.